Rebecca of Lorum Old Rectory, Co Carlow located in the heart of Ireland’s Ancient East, shares one of Lorum’s signature recipes. Serves 4. Allow 25 minutes per 450g of pork at 190 degrees. Dry the skin with a paper towel and season with pepper before putting in oven. When the pork is cooked let it rest for about 15 minutes in a warm place while you make the sauce. Melt the butter in a frying pan and coat the apples in it. Then sprinkle the apples with the sugar and allow to caramelise. When the apples are starting to soften add the whiskey. Give a quick stir, then flambé (stand well back and make sure nothing flammable nearby). 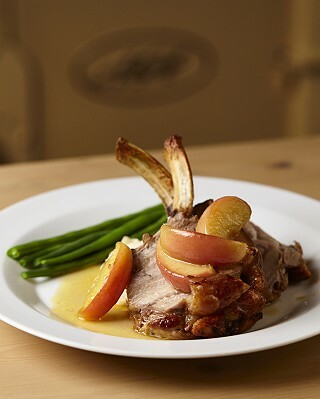 Carve the pork in to thin slices then place slices of apple and syrup on the top and serve with potatoes and seasonal vegetables.